The very best place to see and photograph birds and other wildlife during the frigid northern winter months is warm, sunny Florida. It’s at this time of year that the flow of people to the Sunshine State pales by comparison to the massive influx of birds that have flown south to escape the very same conditions. When these migrant flocks add to Florida’s already extensive resident bird populations, they put on a show found nowhere else. That is why Florida is considered a “must visit” winter location by birders and serious wildlife photographers from around the world. In March, Florida’s nesting season is in full swing and the rookeries are abuzz with the sounds of chicks begging for their share of parental forage. At the same time, other birds are just starting their nesting season and can be seen and photographed as they carry large sticks back to their nest in preparation for their future family. We get to see it all! 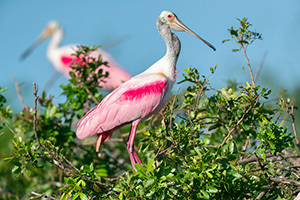 Our Florida Birds—East Coast photo tour coincides with the heart of the annual nesting season. We visit three of Florida’s most active wading bird rookeries, each offering something completely different from the next. These rookeries allow us access—often, just by a few feet—to active nests where we are able to photograph habituated great egrets, cattle egrets, great blue herons, American wood storks, anhingas, double-crested cormorants, tricolored herons and little blue herons, among others, at very close range. 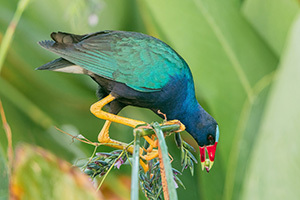 Along with the nesting birds, the wetlands we visit are home to many other species, such as purple gallinules, limpkins, snail kites, snipes, white ibis, glossy ibis and black-bellied whistling ducks. By shifting our attention up into the trees and sky, we also find bald eagles, ospreys, great horned owls, red-shouldered hawks, northern harriers and crested caracaras. We visit a lake shoreline hot spot patrolled by snail kites and limpkins in search of the apple snails they rely on for food. The lake is also home to several active bald eagle nests and our tour is timed to coincide with the fledging of the eagle chicks. Besides the chance to photograph eagles perched in Spanish moss-draped oak trees at or near their nest, we also have the opportunity to capture eagles in flight, sometimes carrying fish back to the nest to feed their young. We are by no means landlocked during our tour. In order to get up close to the action, we photograph part of our time from very stable pontoon boats. 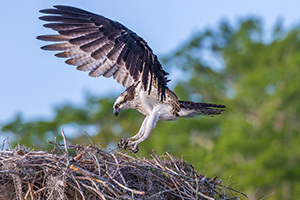 We spend one morning and afternoon on one of the most active osprey nesting lakes in the world, allowing us plenty of opportunities to capture these fish-eating raptors carrying nest material and fish to feed their young. The next morning we board our boat on another lake that is home to a very active roseate spoonbill colony. Often mistaken for flamingos, the vibrant pink roseate spoonbill is a Florida icon and a “must have” species for any bird photographer. There are plenty of opportunities for bird portraits. But what sets this tour apart is the opportunity for action photography. Besides flight shots, we see the birds doing all of their other behaviors, such as nest building, fishing/hunting, courting, and sometimes arguing and mating. Capturing an anhinga with a large fish impaled on its bill while it swims nearby is a great prize—and happens regularly at some of our prime locations. While we primarily focus on bird photography, there are many other subjects to photograph at most of our locations, including alligators, turtles, snakes, frogs and raccoons, plus a variety of other wetland creatures. Occasionally, we may be visited by river otters or a curious bobcat. 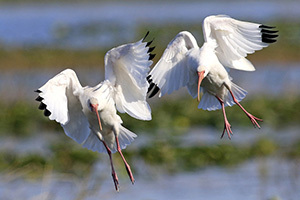 Join us to photograph in the best of Florida’s bird shooting hot spots. Great wildlife and exciting habitats, combined with the wonderful climate in March, make this an enjoyable and productive nature photography experience and a great winter escape. Here is, perhaps, the best possible Florida bird shoot—one you should absolutely not miss! Why photograph with us in Florida? LOCATION! LOCATION! LOCATION! Not all of Florida is created equal. We get you to the right locations at the right times to assure photographic success. Small group size. By keeping our group size to 5 photographers, we are easily able to adapt to any changing situations to take full advantage of the best shooting opportunities. Our tour leader is a south Florida native and life-long resident, and has been professionally photographing the birds and other wildlife of Florida for over 30 years. There is no substitute for this kind of experience. Everything is included. All meals from our first evening welcome dinner in Orlando, all ground and boat transportation—no need for an expensive rental car or to contend with Florida traffic—entry fees, lodging and guide services. Mark Thomas left the pharmacy profession more than 20 years ago to pursue his passion for wildlife photography. Since then, he has photographed on every continent. Images from these trips have appeared in numerous publications including Audubon, Sierra, National Geographic, National Wildlife and Nature’s Best. Mark’s images have won many awards, including 1st Place in the National Wildlife Photo Contest, 1st Place in the Outdoor Writers of America Contest, and his recent work with hummingbirds in South America yielded a 1st Place “Small World” category win in the Nature’s Best Photography prestigious competition. His winning print will hang in the Smithsonian Museum of Natural History through 2015. 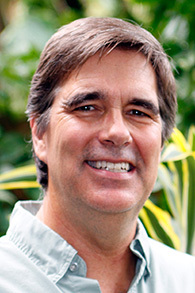 Mark is also an accomplished underwater photographer, is well-versed in Photoshop, and processes and prints all of his own work for art show exhibitions across the country. His images hang in many private collections. Mark lives in Pembroke Pines, Florida.